Cute and colorful puppy pictures accompany a variety of simply presented recipes that you and your pooch can enjoy together. The necessity of less common ingredients makes for more expensive meals, even if they are healthier. Dog-Gone Good Food is an interesting premise – a cookbook featuring recipes for dogs and humans to share. It’s an excellent idea, really, as many pet owners have already begun to shift away from unhealthy packaged foods. It provides simple instructions for some tasty dishes to serve at either table or bowl, accompanied by absolutely adorable photographs of various pooches licking their chops at the dishes placed before them. Pets are a part of the family. From offering moral support with a much needed cuddle to pushing us to exercise when they need walks, dogs are just plain good for us. With the upsurge in discussions of how to eat healthy and clean, a lot of people are gravitating towards eating more home prepared and healthy meals. But what about our best friends? Packaged dog food is often full of fillers and junk that is just as bad for them as a McDonalds diet would be for us. Home cooking is best, both for us and them, but who has the time to prepare two meals every night? 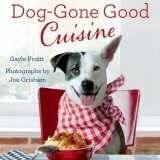 Author Gayle Pruitt offers an ingenious solution with her newest book, Dog-Gone Good Cuisine. It’s a book filled with healthy homemade recipes ranging from the basics like homemade broth and the best way to cook brown rice, to fancier fare like Lamb burgers with cucumber sauce and salmon florentine that are sure to get taste buds (of both the human and canine variety) tingling. That’s right – Dog-Gone Good Cuisine features recipes that are equally healthy and delicious for both people and their dogs. You can cook just one meal, and have something for both of you. Anyone can just bake a lasagna and throw some in a dish for the dog. The benefit to this book is that Pruitt makes sure that each and every ingredient is both safe and healthy for dogs. Most of us know dogs can’t have chocolate, but few of us realize that they shouldn’t have onions, or even that they would enjoy pureed spinach. Each recipe is presented with easy step-by-step instructions that also include how they should be served for canines versus humans. It’s a simple and effective way to begin cooking for your pet, without sacrificing the time needed to cook yourself healthy as well. There is also a section at the end that features canine only recipes, which is a good place to start if you are uncertain about the idea. Start with homemade treats, and work your way up from there. The “healthy” part we keep mentioning is not cheap, unfortunately. The recipes in the book feature mostly gluten free, organic ingredients, which are often much more expensive than their less healthy counterparts but as the author notes, “good food is basic to good health.” There are also tips included on how to do healthy less expensively, and on using all the parts of the food (for instance, saving the fiber from juiced fruits as dog food filler). While some of the recipes included seem rather basic, it provides a good look into what types of ingredients are best for your pet, and why. 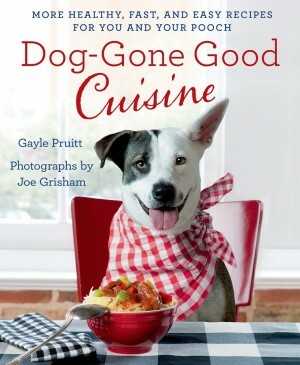 Dog-Gone Good Food is an interesting premise – a cookbook featuring recipes for dogs and humans to share. It’s an excellent idea, really, as many pet owners have already begun to shift away from unhealthy packaged foods. It provides simple instructions for some tasty dishes to serve at either table or bowl, accompanied by absolutely adorable photographs of various pooches licking their chops at the dishes placed before them. Those looking to ease into the idea of cooking for their pets may initially be turned off by the need for gluten free and organic choices, as well as less common pantry items like coconut oil or quinoa, but the benefits of eating clean for both human and pet are hard to deny.